The Epiphany is one of my most beloved Spanish Christmas traditions. Not only does it extend my holidays by a few days, but the Cabalgata parade means that candy literally rains down the streets of San Jacinto. Spanish children await their gifts from three wise men who travel on camels, distributing gifts (or coal) much like the Magi did when they traveled to see the Messiah. Santa Claus is making waves in Spain, but Gaspar, Melchor and Baltazar are three of the most recognizable faces for a Spanish child. Apart from collecting hard candies that will serve as bribes for my students until June, people also gobble up the Roscón de Reyes, a sweet cake filled with cream or truffle fluff that’s traditionally served during the afternoon of January 6th. What it is: A panettone-like cake made from flour, sugar, eggs, butter, milk and yeast, plus a few spices. Sliced open in the middle, the cake also has cream in the middle and is decorated with sugar-dipped fruits and sliced almonds. It’s essentially the first cousin of a King’s Cake, traditionally eaten in New Orleans on Fat Tuesday. 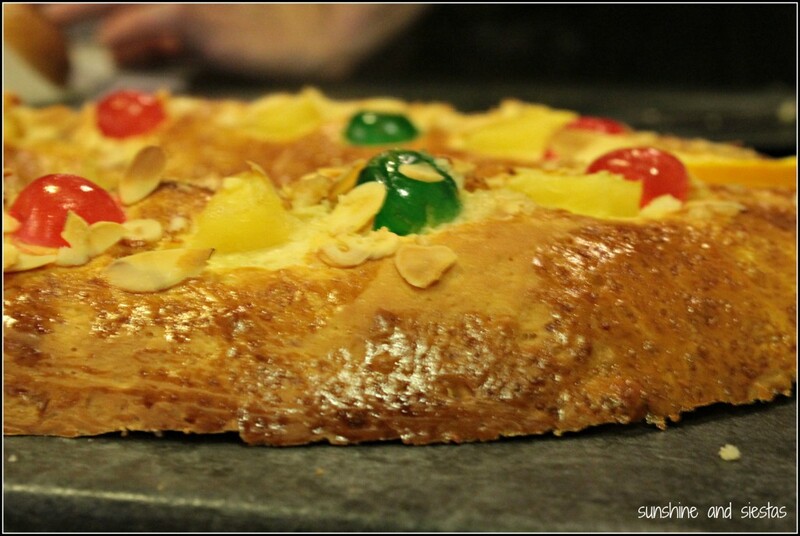 Where it’s from: Roscón – and its variants – have long been served in Spain on the Epiphany. The tradition actually began in Rome, when cakes commemorating the Three Wise Men’s search for Christ were served first to the poor and then divvied up for soldiers on the 12th night after Christmas. He who found the lima bean within the cake was exempt from work that day. Nowadays, the person who finds a small plastic baby is the King or Queen of the afternoon, whereas the unlucky recipient of the bean must often pay for the cake the following year! Goes great with: Coffee – it helps cut down on all the sugar you just consumed. Where to find it in Seville: Roscón is one of those dishes that you’re better off buying – without a Thermomix, it’s pretty laborious! Head to any confitería and reserve one (I prefer Filella and Lola in Triana), or even pick one up in a supermarket if you’re in a pinch – a cake for 8 people will run you about 20€. The Three Kings have a completely new significance for me – my son was born on January 4th and received a visit from Gaspar, Melchor and Balthasar before leaving the hospital. In fact, we were released from the hospital on the Epiphany, only to be told that the Cabalgata was passing right in front of the hospital. My first food at home after his birth was Roscón, and the small toy tiger my fatherin-in-law bit into that night will forever be treasured. If you like the Three Kings Cake, try some other convent sweets like Huesos de Santos, Yemas de San Lorenzo or Roscas de Vino. 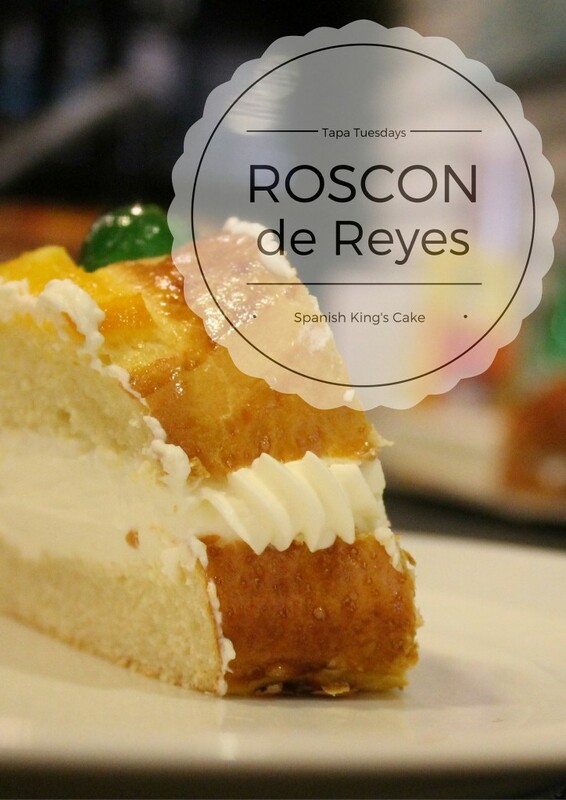 Have you ever tried Roscón de Reyes? I would have been totally clueless about La Rioja unless it was for a Spain-born love of red wine and Liz Carlson’s Young Adventuress blog. And without knowing it, I may have saved some of the best of Spain for last. 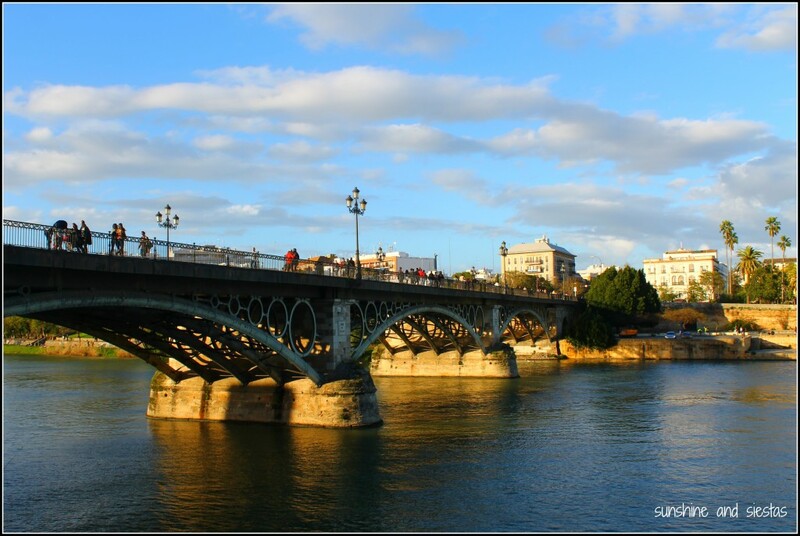 Provinces: Just one, with the administrative capital located in Logroño. About La Rioja: Despite having the smallest population in all of Spain, this region packs a lot of punch worldwide because of its wine. Reds, whites and rosés – many of which are celebrated – are manufactured from grapes grown in the vineyards that spain La Rioja and the southern end of the Álava province in País Vasco. This area was once part of the Roman kingdom of Hispania Tarraconensis, based in modern-day Tarragona. Given its positions between kingdom kingpins like Aragón and León, the area was hotly disputed by even smaller dukedoms, but the Moorish Invasion of 711 meant that La Rioja was soon grouped into the Al-Andalus kingdom. After Sancho the Wise swooped in during the early 9th Century of the Reconquista, he claimed the land for the Kingdom of León. After a bitter feud against the Kings of Pamplona-Navarra, La Rioja was given independence as the Kingdom of Viguera before being swallowed up by Pamplona once more. 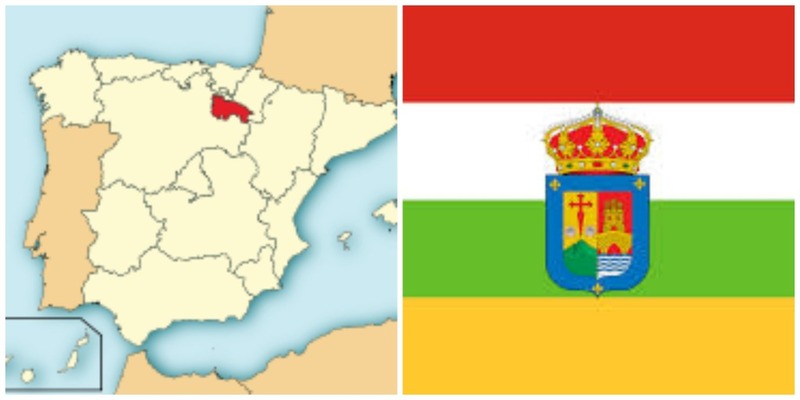 The region continued to be jockeyed between Pamplona, Aragón, and the soon-united Castilla y León as part of both Soria and Burgos before a new administrative district was formed in 1822 by the Regio reform. La Rioja got its modern name in 1982 when the Spanish Constitution was passed into law and Autonomous Communities were given more self-governance. The province stands for more than just their cash cow, but for a place where wine is an integral part of the culture. Oh, and dinosaur footprints have been found here, so toma. Must-sees: It should come as no surprise that wine is the main attraction in this tiny autonomía. More than 14,000 vineyards and 150 wineries fills the 75 square miles of the Denominación de Origen, whose lifeblood is the snaking Ebro River. The earliest reference to wine in La Rioja is dated in the late 9th Century, and thanks to the continental Mediterranean climate and a series of peaks and valleys that protect the vineyards from the wind, several highly rated wines have been produced here. The most common grape varieties are tempranillo and garnacha, and the technique of aging wine in oak barrels for at least one year sets wines apart from other Spanish DOs. You can visit a number of the wineries in La Rioja, particularly in the Álava province and outside of Logroño. 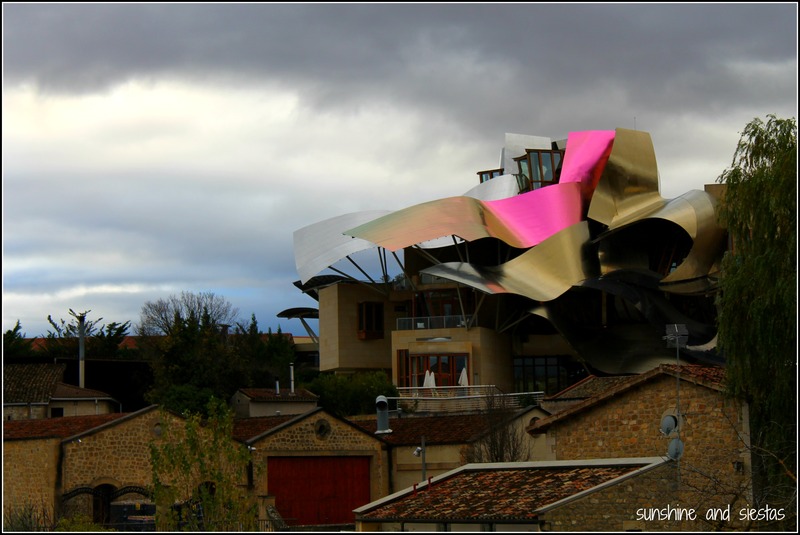 We stuck to just a few – Bodegas Darien on the eastern edge of the city, Marqués de Riscal in Eltziego, Laguardia and its underground medieval aging caverns (as well as trippy Bodegas Ysisos) and romantic Haro. 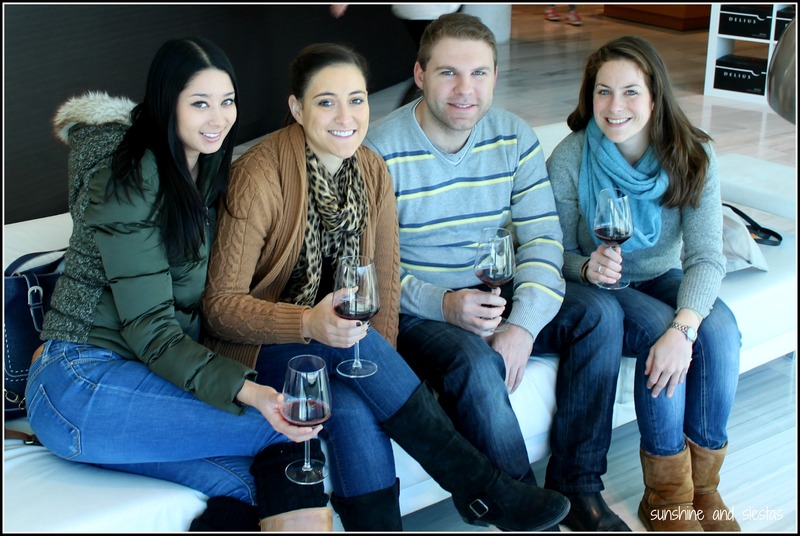 Our wine tasting trips were pre-booked and included a guided tour and several tastings afterwards. 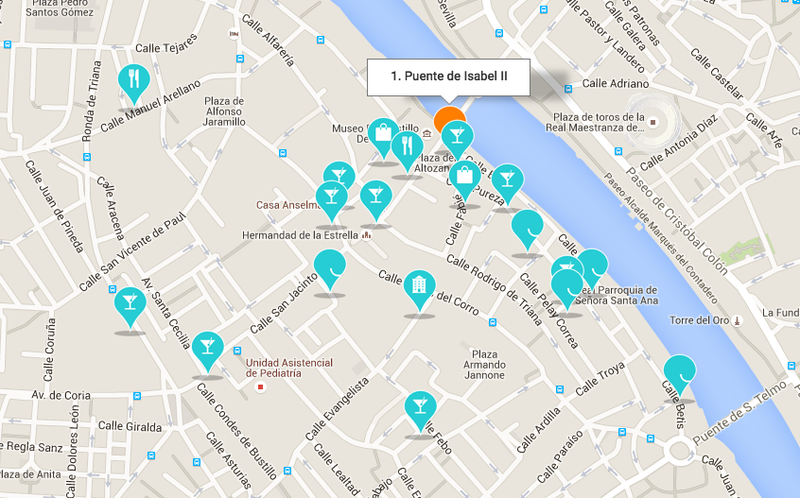 There are a few bodegas within walking distance of town, as well. 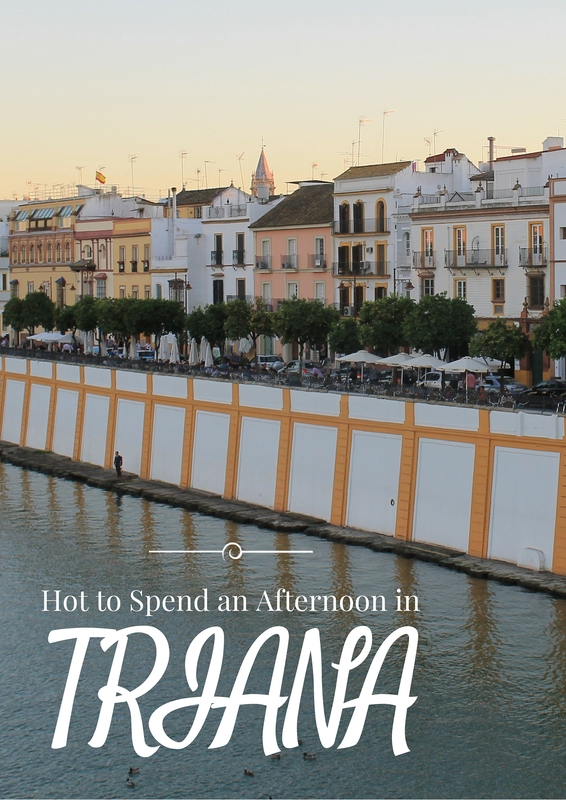 If you can rent a car, get out of town: Haro and Laguardia are beautifully preserved towns, and a visit to the monasteries of Yuso and Suso means you can get your Spanish nerd on: the first written records of Castillian Spanish are housed here! Apart from that, Roman ruins are scattered around the province and each of the 174 villages seem to have their own flair. I’m all for Spanish public transportation, but La Rioja is one place to rent a car (so long as you’re not imbibing!). My take: Admittedly, my four-day trip to Rioja has a lot of speed bumps. Getting ticketed by cops! Having my cell phone robbed! SO MUCH SPILT WINE! But I loved our venture north, and my companions and I often talk about it being the last weekend hurrah before we got into the heavy adult stuff. Apart from indulging on Calle Laurel and in little blips of wine towns, we had a chance to not focus on ticking off historical sites or racing to see museums before closing time. I’ve got a preliminary plan to drive up to Madrid in May and pick up a friend so we can spend a long weekend in Logroño together. After all, eat, drink and be merry! 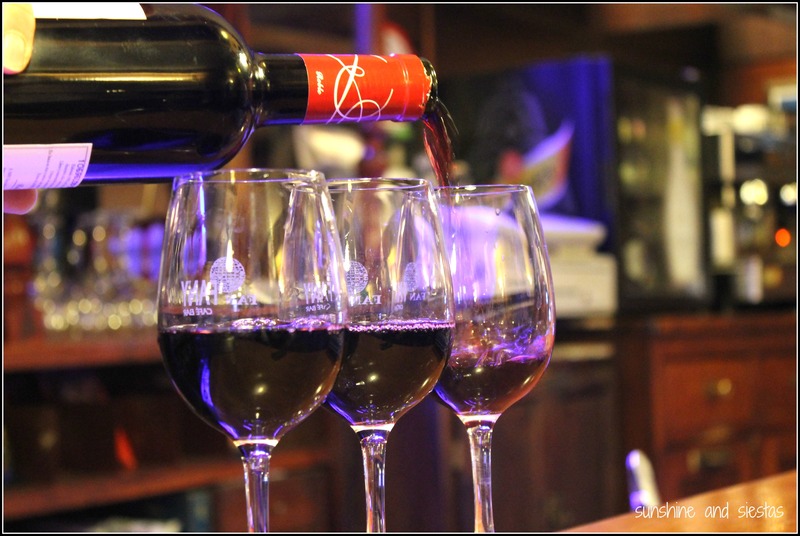 Have you ever been to La Rioja? What do you like (or not) about it? Food in Barcelona has always made me skeptical, despite a rich culinary history and the production of several globally recognized chefs. I’ve been to La Ciutat Comptal half a dozen times, but couldn’t recall being impressed by much, save a seafood paella in Barceloneta before I’d tried the real thing. 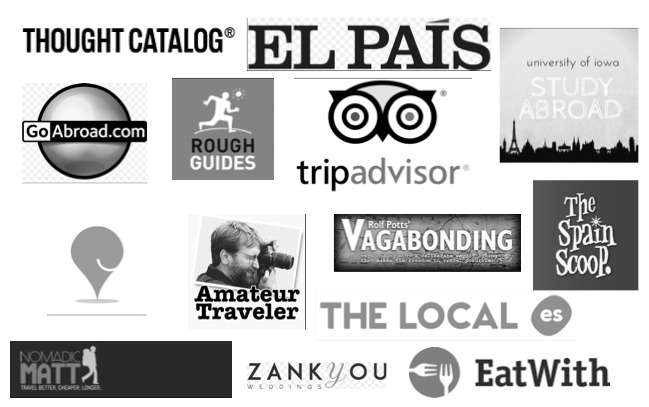 So I left it up to the experts – my friends at Devour Barcelona Food Tour. I’d taken their pilot tour in Madrid and knew that founders Lauren, Alejandro and James appreciated not just the food itself, but the person behind the dishes, making the tour a perfect mix of cultural, gastronomical and historical. Renée met us on a blustery January morning on Passeig de Gràcia. Being the force behind Devour Barcelona is her dream job. She immediately gave us a hand out that detailed what we’d be eating on the four-hour tour, but I preferred to be surprised. The tour seemed to get off to a slow start. 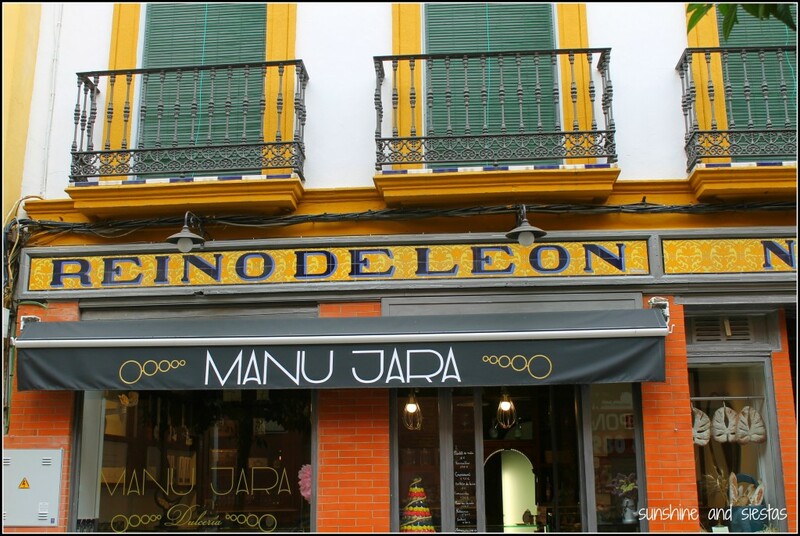 Apart from walking about ten minutes towards the Grácia neighborhood, we began with a pastry. Admittedly delicious, it didn’t tell me much about Spanish cuisine, much less Catalan. 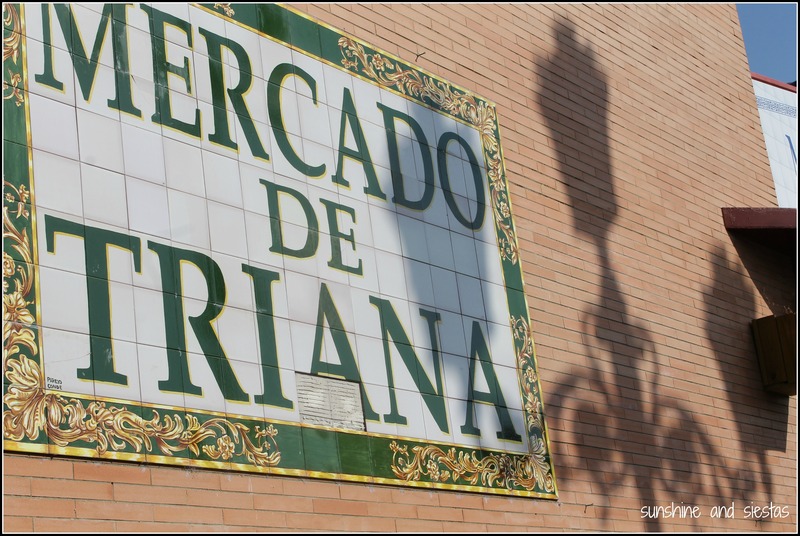 And once we reached Gràcia, a neighborhood that feels like a small city itself, our trip to the market yielded two more Spanish staples. 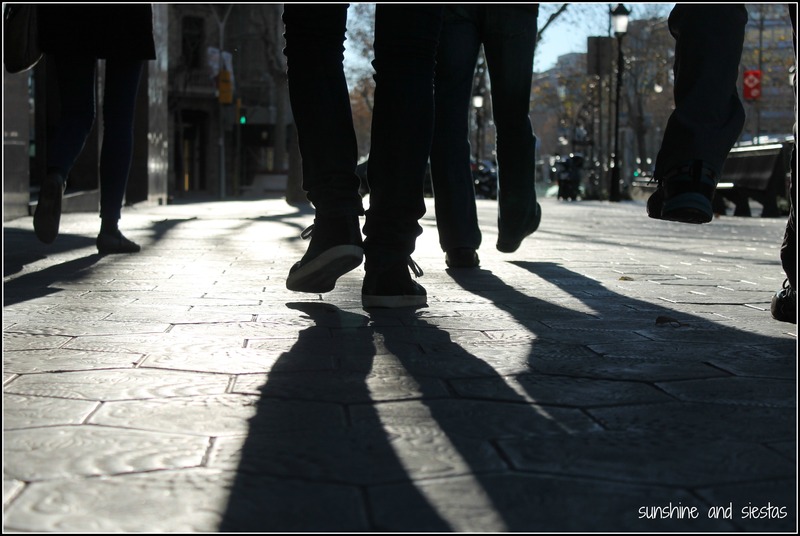 We hit the 10am mark and Gràcia began to wake up – and we got a real taste for Catalan gastronomy. Bar Pagés welcomed us into a shabby chic bar with round wooden tables, comfortable arm chairs and a smashing wine selection. The family behind Casa Pagés, a family restaurant in the same neighborhood, opened this smaller snack bar, which looks like the hybrid of a wine bar and coffee shop. Renée told us about cava, the “confused cousin” of champagne. Made mostly in the Penedès region of Catalonia, cava uses grapes native to Spain like Macabeo, Xarel.lo and Parellada. And the reason it’s so cheap? 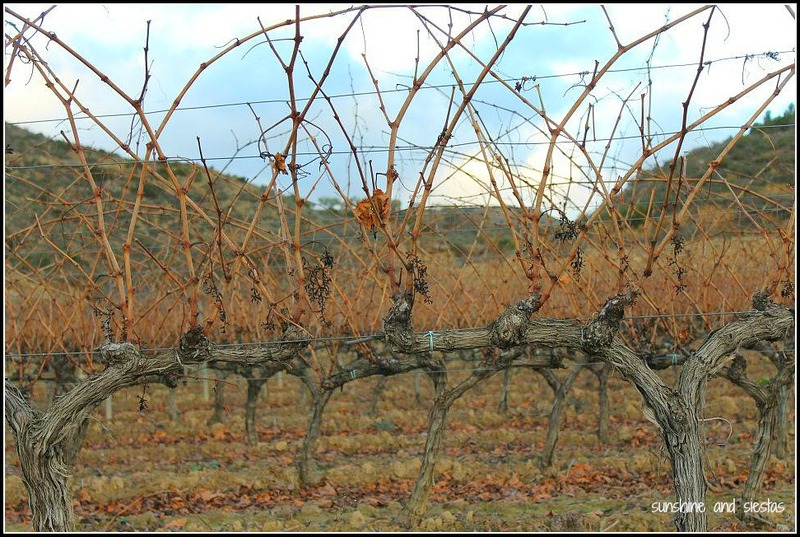 Cava is the region is largely produced by machines! 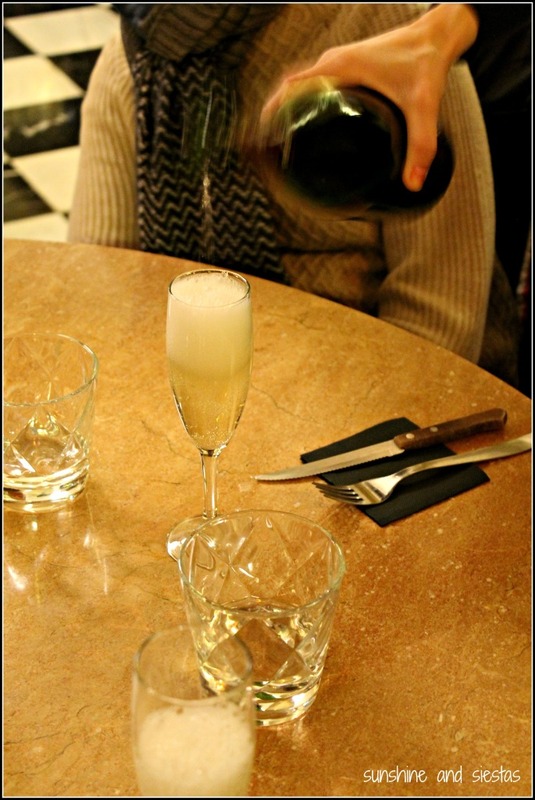 And it’s also a standard morning drink, the way anisette is in Andalucía, so bubbly for breakfast didn’t feel strange. After we’d been poured a glass and toast, our second breakfast was served: a simple botifarra sausage sandwich with roasted green pepper and crushed tomatoes. Simple, hearty and crazy delicious. Like many, Carlos and his wife found themselves out of work when the crisis hit. They decided to take over a neighborhood bar called La Anxoveta and breathe life into catalan food staples. Here we’d be sampling two more heavyweights of local gastronomy: pa amb tomàquet and bomba de Barcelona. Carlos came out with his hands practically talking for him as he rattled off questions to us. He explained the pa amb tomàquet as Renée translated that this simple dish that was once a poor man’s breakfast has become one of the region’s most beloved foods. He cut two slices of pan de cristal, a thin, rustic piece of bread, then showed us how to add the tomato, olive oil, garlic and salt so we could do it on our own. 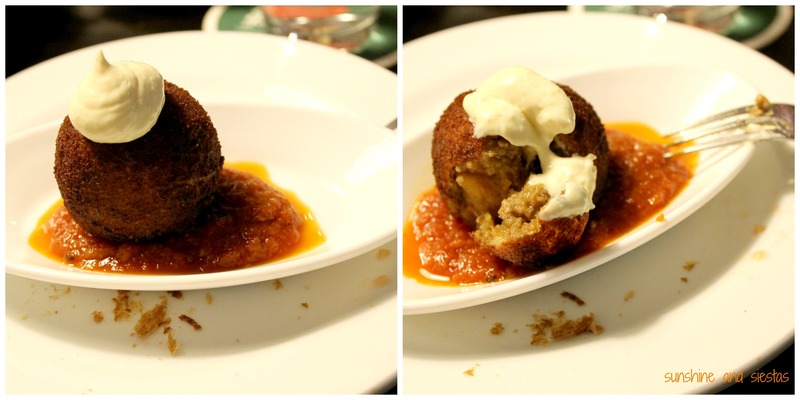 Next out came the bomba, one of Barcelona’s signature tapas. Born out of a bored cook with a revolutionary streak, María Pla invented the bomba in the 20s as a response to the anarchist violence playing out in the street. The weapon of choice was a cast iron ball with explosives inside that had to be lit with a fuse. Pla’s neighborhood of Barceloneta was a hotbed of activity, and her playful take on food and history has endured. Renée claims the bomba at La Anxoveta is the best in the city – it’s like a glorified croqueta with potato and ground beef, sitting on a bed of spicy tomato sauce and topped with a garlicky alioli sauce. Our walk continued through Gràcia. This part of the city was once a separate village and home to holiday villas; with the industrial revolution, the city’s population surged, and L’Eixample was born. 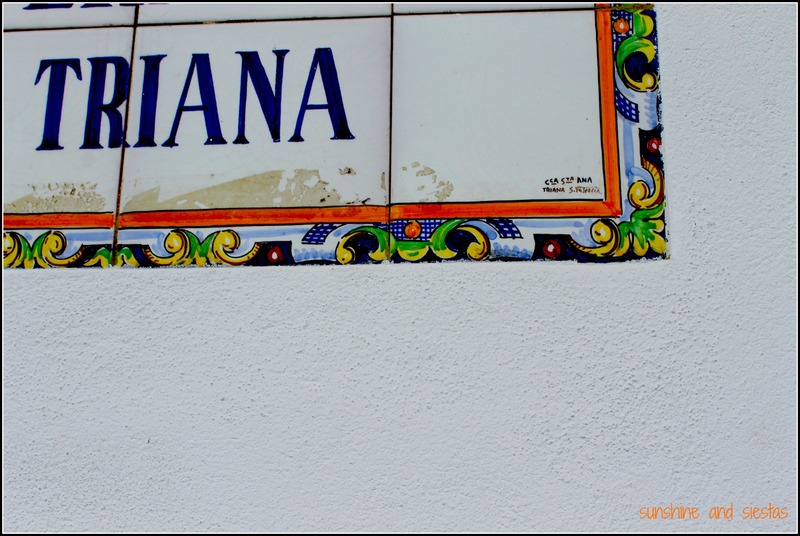 Gràcia was swallowed up by the city, but the barri is like a whole different city surrounded by a city, much like my Triana. 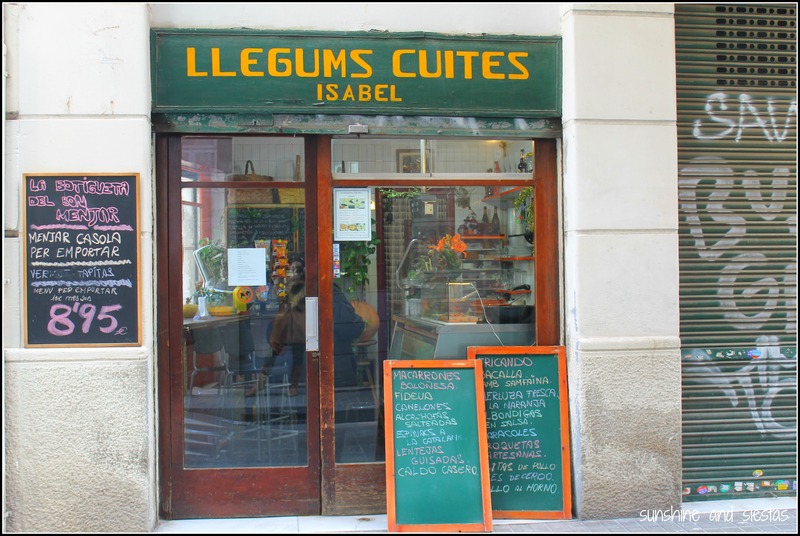 Gràcia has also opened its arms to foreigners, both domestic and international, and the streets are lined with boutiques and restaurants, snack bars and pastry shops with international fare. Mustafa is one of Gràcia’s business owners, a Syrian national who came to Barcelona on holiday and decided to set up shop. He was a man who spoke very little on his visit, but I left wanted to give him a hug. Mustafa’s pastry shops is simple – it is clean, smells faintly of honey and offers only the Syrian pastries to patrons and to Middle Eastern restaurants around the city. We could choose one, and given how perfect each one of them looked, it wasn’t easy. I watched as the other four chose chocolate or honey confections, but I took a small one with almond. 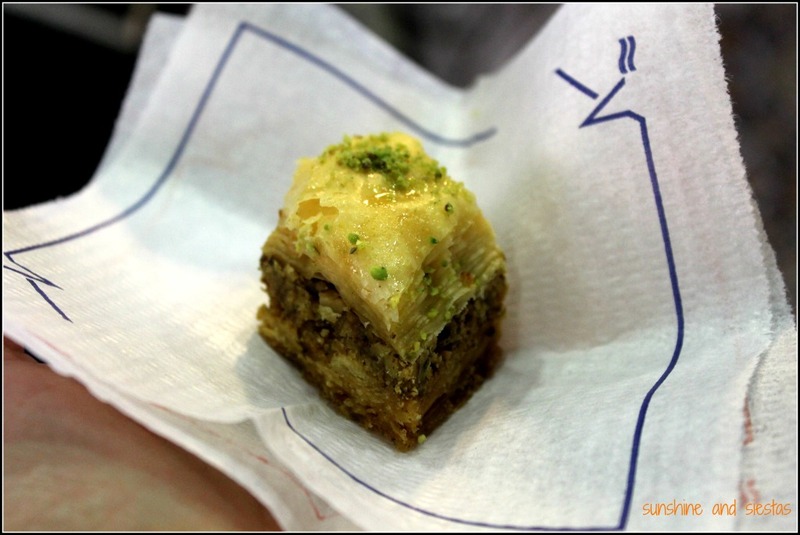 Growing up across the street from a Greek family, I’d loved baklava from a young age, and the almonds coated in honey and the flaky pastry layers had me back on Silverthorn Drive. It’s almost inevitable – at 1pm on a Saturday, my body needs a cerveza. 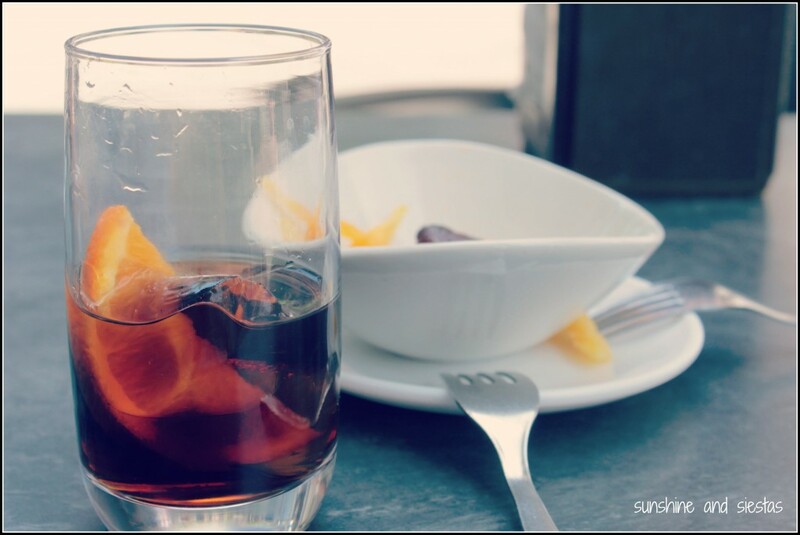 When Renée suggested going for a drink in the sun-drenched Plaza de la Virreina, I knew she’d take us somewhere great. 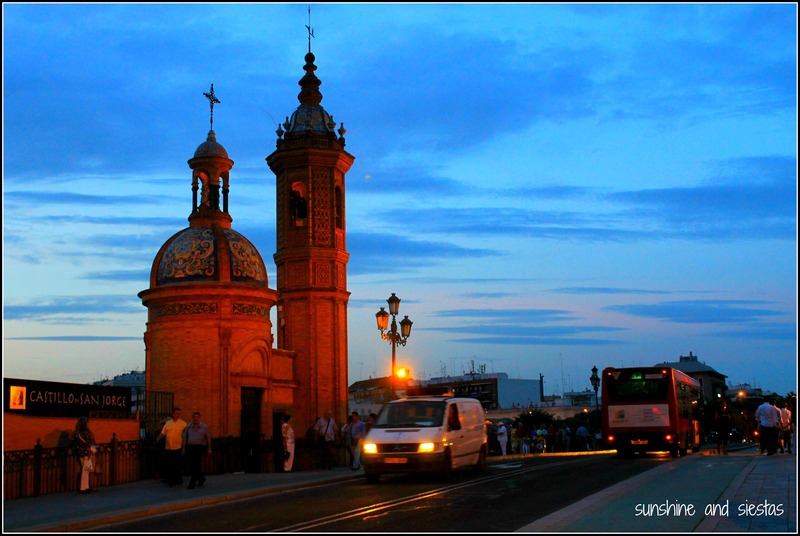 Up the hill towards Gràcia, she confessed that finding C’al Pepe – or Joe’s House – was a totally lucky find. Catherine and I were psyched – Joe’s Place is the de facto Old Man Bar of our college town – and C’al Pep did not disappoint. There was no bar, no menu, no other guiris in sight. Rafa had taken over from the original Pep and strove to maintain the bar’s ambience. It truly had the hallmarks of an old man bar: old vermouth posters hung on the walls, yellowing at the edges. Siphones and old Westerns on the TV. We even had the requisite Spanish abuelos at the end of our table. 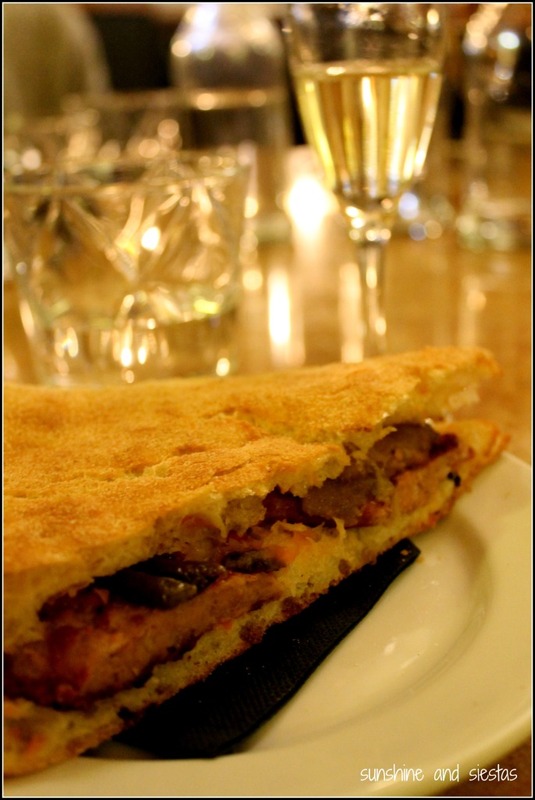 We were served a glass of sweet vermouth with fuet sausage and pickled anchovies. Between the bar, the company and the snacks, I had fallen in love with Cal’s bar, Gràcia and perhaps even softened my hard feelings for Barcelona’s food scene. After one last dessert and a coffee, we did as the Spaniards did – lay down for a nap and let the food coma pass. 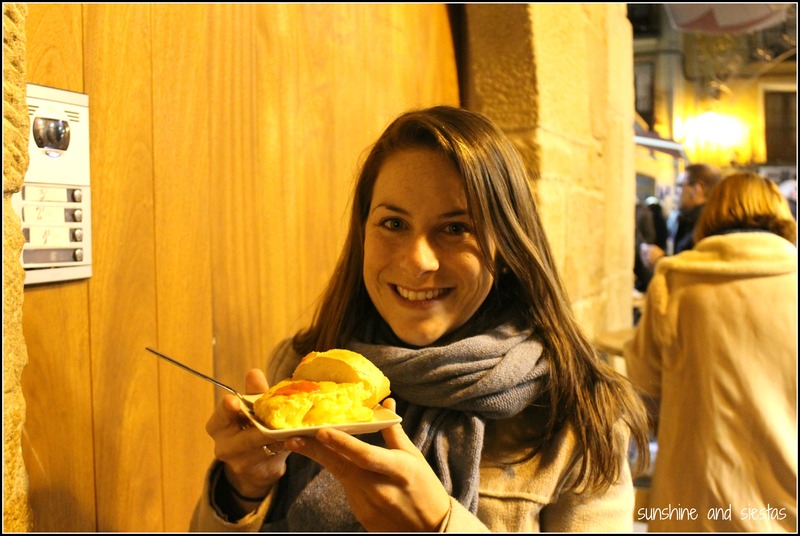 Devour Spain food tours graciously let me chow down for free, but all opinions and calories consumed are my own! 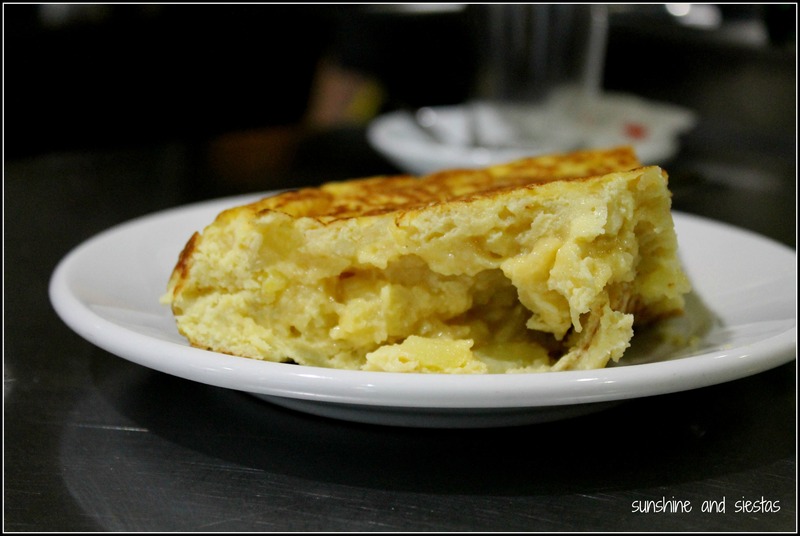 Have you ever eaten well in Barcelona? Check out my other recommendations for food and a chance to win an eBook from Eat Guides Barcelona! The more immersed I become in the Spanish gastronomic world, the more interest I have in where food comes from, who makes it (or butchers it or cures it or raises it) and the stories behind everything I consume. I recently spent the day with Joanna, the founders of Insiders Madrid. I was jet lagged, emotionally fraught from my grandfather’s death and not really sure what day it actually was. Given the choice between many different types of tours, I chose the follow my nose and stomach on the Gourmet Food Shop Tour on a bright June morning. 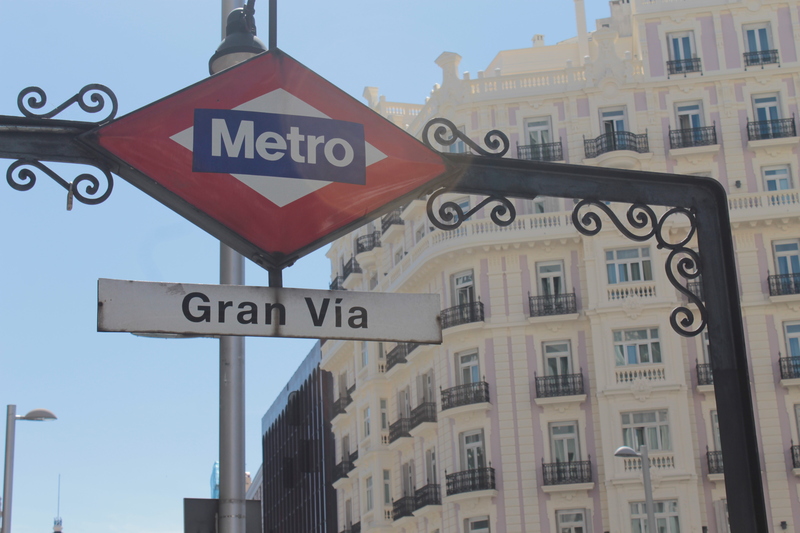 We met right on Gran Vía, the juxtaposition of old Madrid and shiny new Madrid. Apart from snacking at four stops along the way, I was able to meet the owners and operators of some of the most renowned food shops in Spain’s capital. Joanna has traveled extensively and worked in television for years before deciding to follow her passion: to provide luxury and off-beat tours to people from around the world. 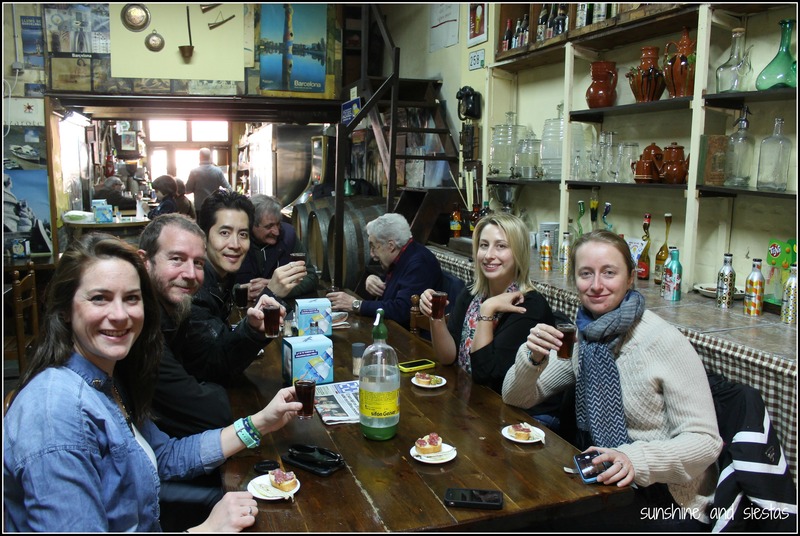 Between samples of Spanish foods like ham and olive oil, we shared stories about dining and drinking in Spain. 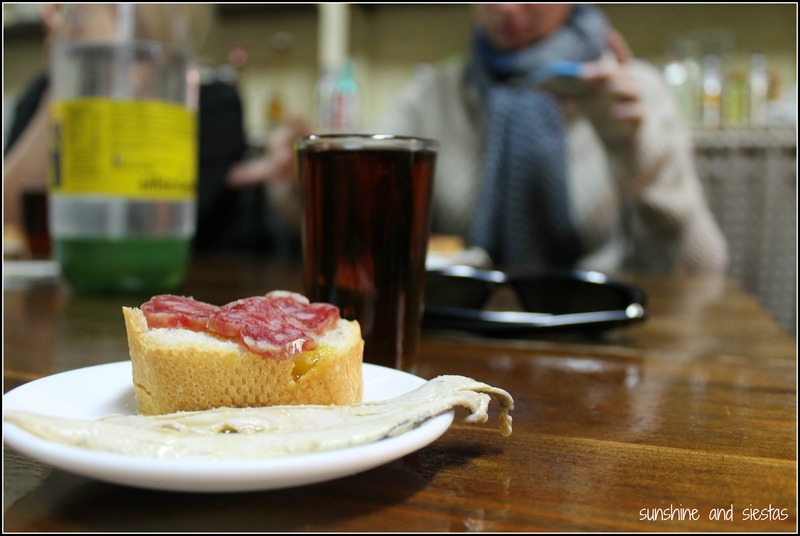 Our first stop in Malasaña was at Madrid’s oldest charcuterie. 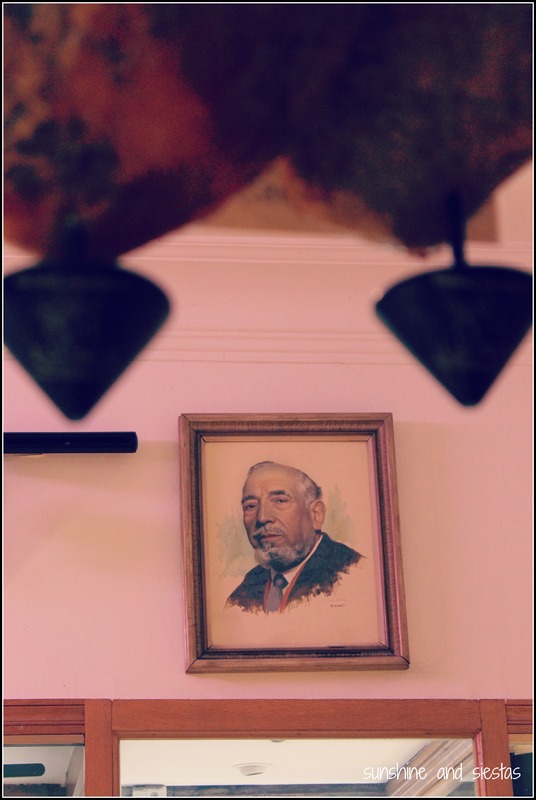 A photo of owner Antonio’s grandfather – the shop’s founder – hung above the door. 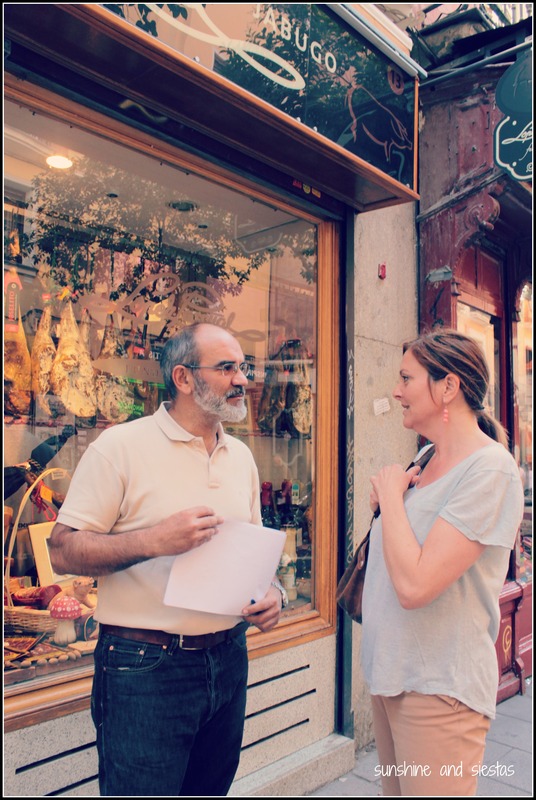 Antonio explained the way that feed and climate can affect the taste of the ham, mixing in family anecdotes from nearly a century of holding down the shop in an area of town that has seen major gentrification in the last few years. Antonio’s shop sidles up to hip boutiques and art galleries that double as watering holes. 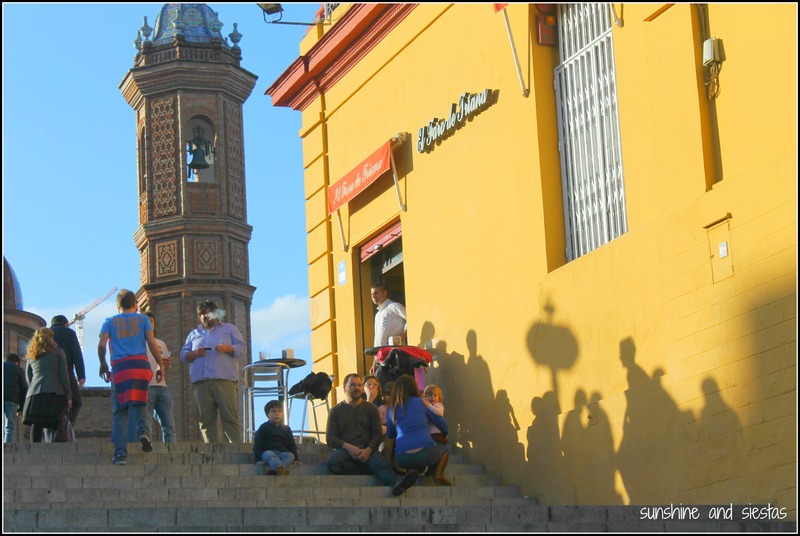 We snacked on freshly cut ham and picos and artisanal beers brewed just around the corner. At the nearby church of San Antonio de los Alemanes, a priest gave us permission to look around in the oval-shaped chapel that has been dubbed Spain’s very own Sistene Chapel. He excused himself to tend to business down a spiral staircase as Joanna paid a small donation. After the financial crisis hit Spain, the priests at San Antonio opened a soup kitchen, called a comedor social, downstairs to serve those affected by unemployment and wage freezes. The money we paid for an entrance went right to feeding the needy. My jet lag must have been noticeable, as Joanna suggested we go for a coffee at one of Madrid’s most prolific cafeterías, Café Comercial. The age-old, mirrored cafe was calm in the break between breakfast and lunch, but I chose a vermouth over a coffee, convinced I’d crash after so many coffees. The establishment is run by Fernando, a young restaurateur who has been in the food service industry for two decades, and who invited me to breakfast the next morning. Joanna says the café doubles as her office – she meets clients and food providers here over a coffee or vermouth. As we chatted over fresh orange juice and enormous toasts, Fernando pointed out the bar staff. Most had been working for Comercial for well over ten years and could speak of the evolution of a well-known establishment whose clientele de toda la vida had come and gone. Fernando told me about clients who had been around forever, eating the same dish and sitting in the same chair for ages. 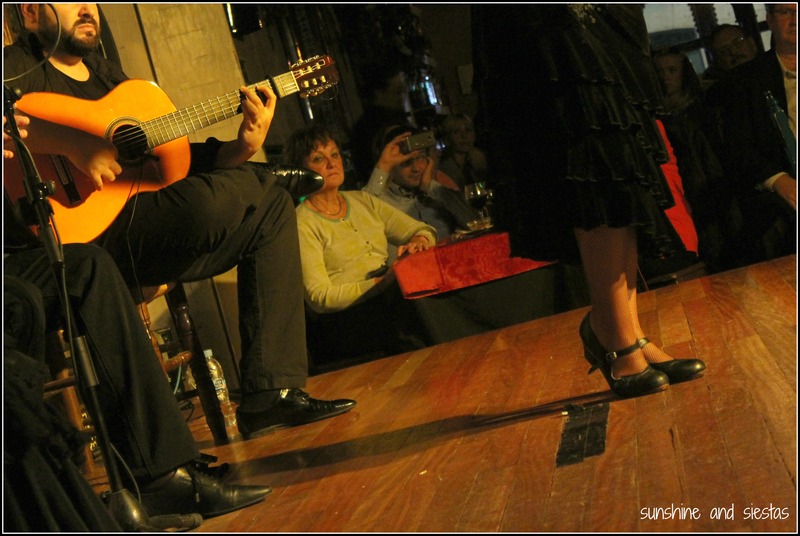 Fernando is working to breathe new life into an old place by adding vermouth tastings, language exchanges and theatre performances. 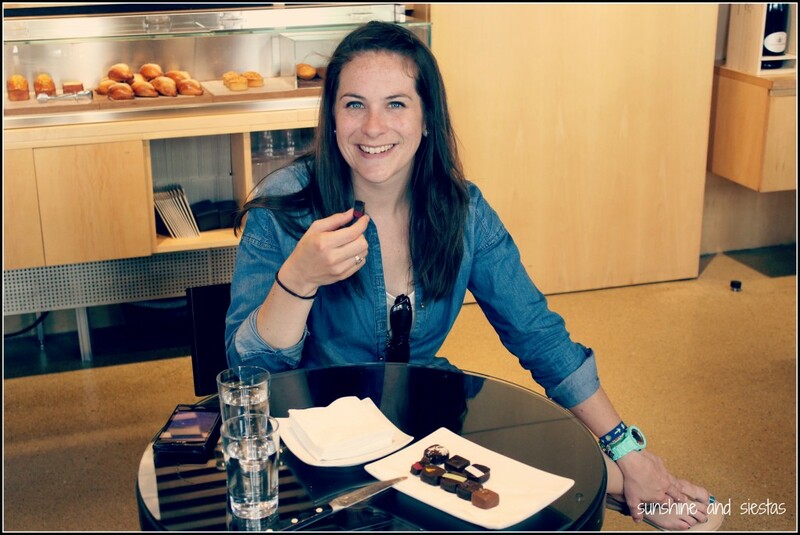 Racing the clock, we sampled olive oils from beyond Andalucía before ending on a sweet note: a chocolate tasting at a renowned chocolate bar. Joanna chose six or eight different flavors, each of which had been blended with cocoa beans to form outages flavors with hints of spice, cheese and fruit. As we closed the tour with a quick caña after the sugar rush, we got to talking like old friends about our shared passions: food, drink and Spain. Joanna and Seth of Insider’s Madrid graciously invited me on their Gourmet Food Shop tour, but all opinions are my own. 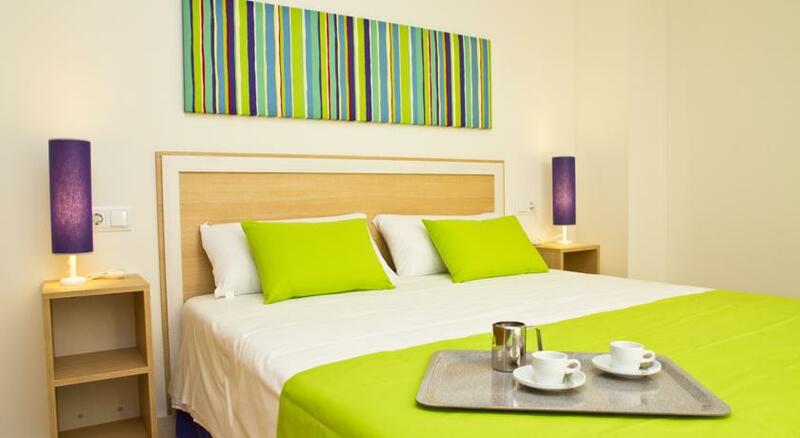 The tour lasts approximately three hours at the cost of 65€ per head, which includes all tastings. Purchases at the stop are at your own cost. 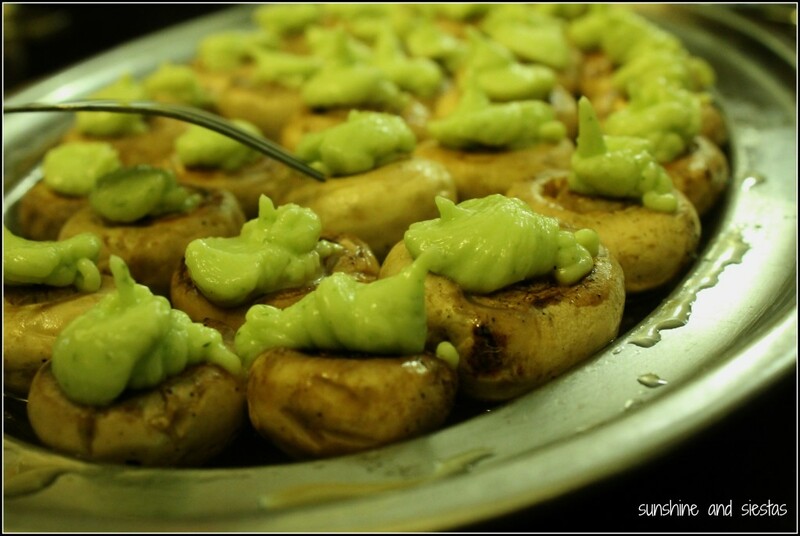 Love Spanish food? 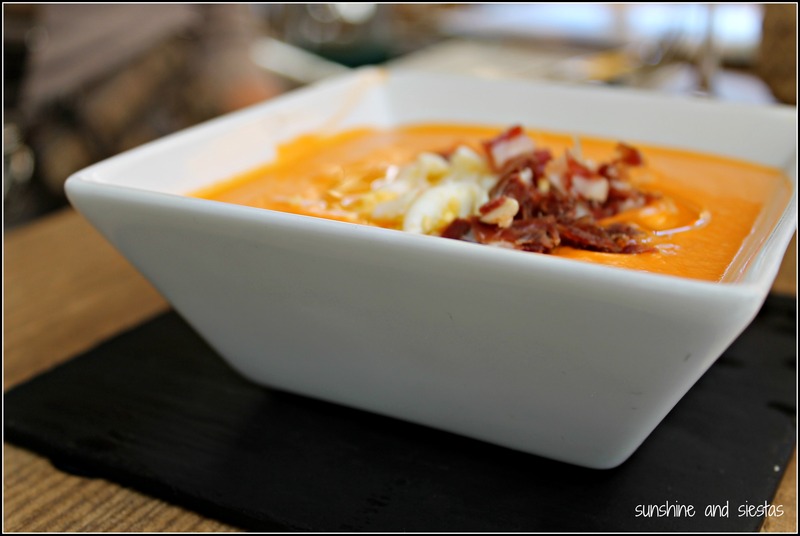 Check out my biweekly food feature, Tapa Thursdays! Just as soon as it came, spring has left. In other words, it’s already too hot to sleep. My diet changes with the weather – just as soon as I’ve put away my heavy sweater, I stop eating lentejas. With my summer wardrobe comes gazpacho, salad, caracoles, fried fish and banderillas with my beer. What it is: A banderillas is a snack that takes its name from the barbed sticks used in bullfighting (and, according to Google images, also the name of corn dogs). Pickled vegetables are stuck onto toothpicks and eaten in one bite. These vegetables can include gherkin pickles, red peppers, cebolletas, guindilla peppers and olives, and sometimes include anchovies or even chunks of cheese, depending on preferences. Goes great with: Beer and a warm, sunny day! 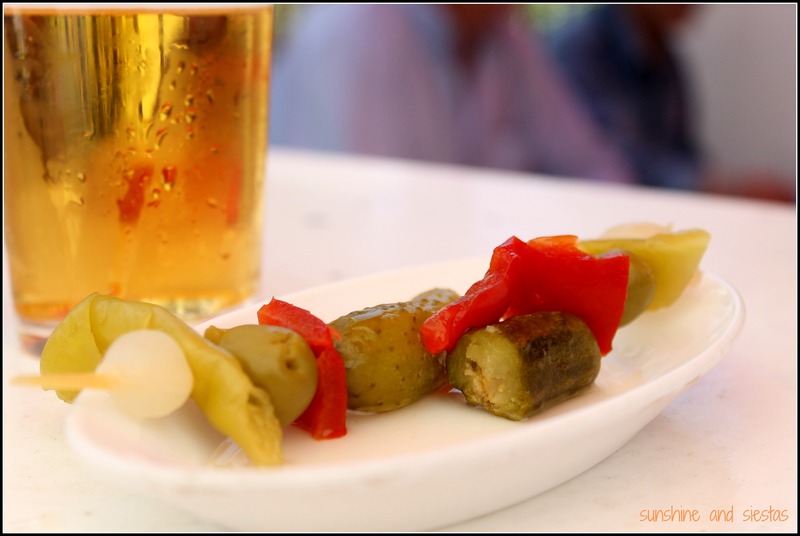 Just don’t drink them with wine – the banderillas are briny with a kick from the pepper and therefore kill the taste of a robust tinto. 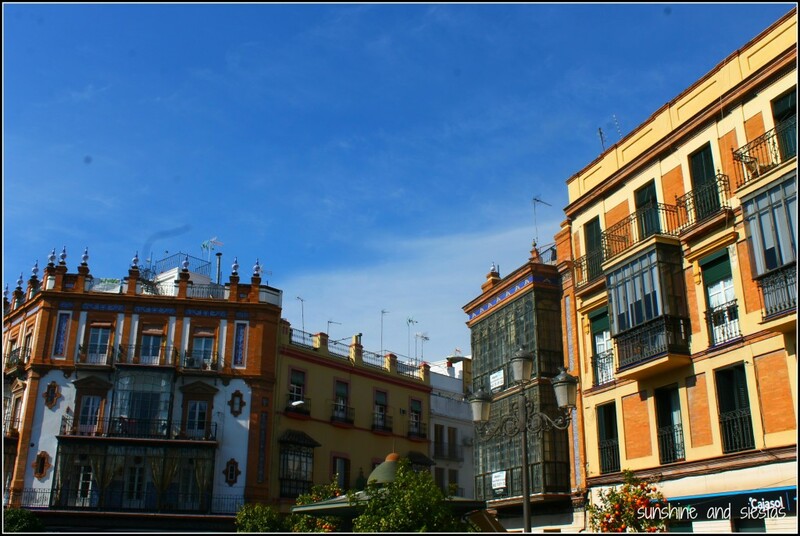 Where to get them in Seville: The banderilla is great for parties, and you can buy pre-made jars at the supermarket or make them yourself at home. As something to matar el hambre after work, I’ll grab a tapa from La Melva (Cardenal Ilundain and Manuel Siurot) or any other old man bar. What are your favorite bar snacks? Do you like banderillas?